He was born in Khankendi on the 12th of January, 1958. He was called for military service after finishing secondary school # 4 after Nizami Ganjavi. N. Mammadov completed his military service in Irkutsk city. After demobilizing from the army, Nizami first worked in Khankendi City Planting of Greenery office and later at Garabagh Silk Factory. But his wish was to become a police officer and therefore he entered Baki Special Police School. After comleting his education, he started working at Khankendi city Police Departmen as an assistant on duty. 1988…was the most aggressive times of Armenian gangsters against peaceful Azerbaijani citizens. N. Mammadov had to stand against his own colleagues. Armenians attacked the districts where Azerbaijani people lived on the 18th of February. Nizami was there to protect the civilians against the aggressors. Nizami could not stand this aggression anymore and that is why changed his working to place to Shusha Police department in 1989. He was working day and night and taking provisions and ammunition to the front lines in Karkijahan and Gaybali villages. Shusha soon lost all the contact with other regions. Bloody battles were going on for every inch of Azerbaijani lands. Nizami was in the front line of these battles as well. He earned a good reputation of a brave soldier while fighting in those battles operations for the sake of Malibayli, Dashalti, Galadarsi villages. But his life pass unfortunately was short. The brave soldier was killed by a sniper bullet on the 29th of March, 1992. He died heroically. Nizami was married ad survived by three children. 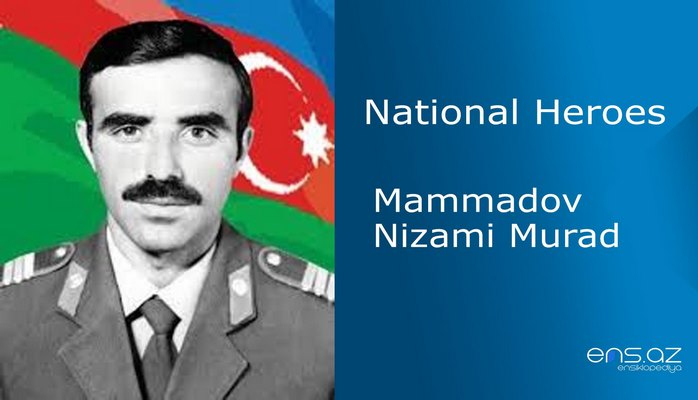 Mammadov Nizami Murad was posthumously awarded the title of the “National Hero of Azerbaijan” by the decree # 264 of the president of Azerbaijani republic on the 8th of October, 1992. He was buried in Daymadaghli village of Barda region.